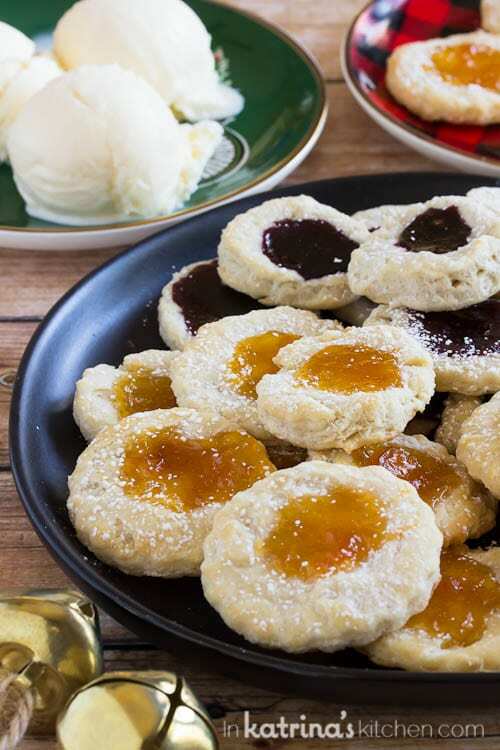 Use flour, butter, and ICE CREAM to make pastry dough for a fun spin on traditional kolacky cookies. 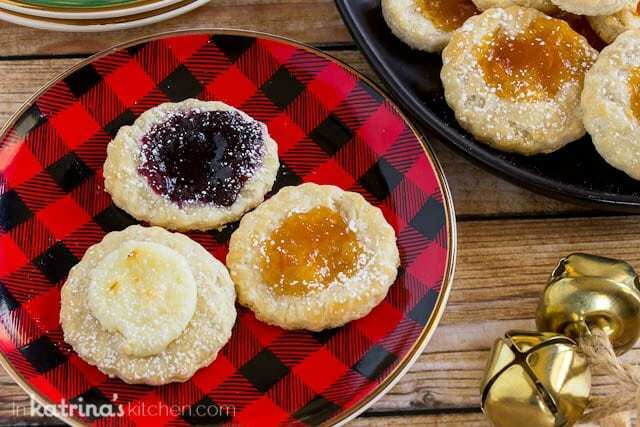 Top with sweet cream cheese or thick jam to make this holiday cookie irresistible! I’m happy to join The American Dairy Association Mideast for their annual Cooking Together to Give Gallons, a holiday recipe exchange to give the gift of milk through the Great American Milk Drive. 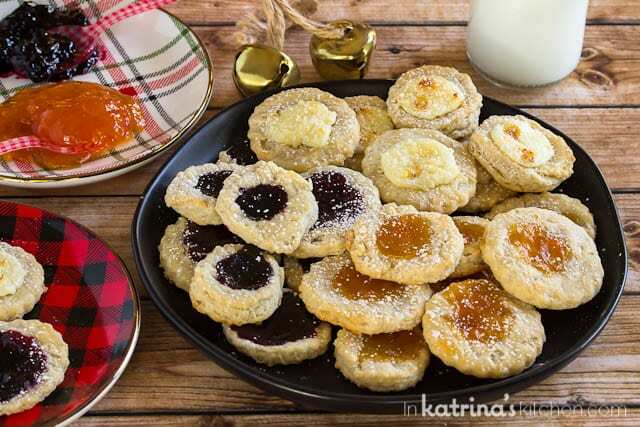 Our family comes from Czechoslovakia and we’ve been making kolacky cookies in one form or another for generations! I can’t taste these cookies without thinking of my sweet grandmother. As a child I never had the patience to learn to speak Slovak from her but I did enjoy being in the kitchen with her while she churned out heaping piles of Christmas cookies. A kolach (plural kolache, also spelled kolacky , from the Czech and Slovak plural) is a pastry that holds a dollop of fruit, rimmed by a puffy pillow of flaky dough. Since the dough to these cookies only uses flour, butter, and ice cream it is an easy recipe to make with children. There aren’t a lot of tough measurements and the baking process is broken up over 2 days so if kids only have a 15 minute attention span they will love this recipe! Seriously- scoop ice cream right into the bowl with flour and butter and *bam* you have a quick pastry dough. It’s pretty much Christmas magic. This dough works best if you refrigerate overnight so please keep that in mind. After you cut the butter into the flour and then mix in the ice cream you’re going to knead it smooth for 6-8 turns. There isn’t any yeast in here so you’re not going to overwork it- don’t worry! Just get it looking semi-smooth then separate it into three discs. Wrap them in plastic wrap and refrigerate overnight. Each disc will make 12 cookie rounds (using a 1.5 inch circle cutter). You’ll see actual bits of butter and ice cream in the dough still; that’s what you want! These will create delicious, flaky air pockets when you bake up the cookies. 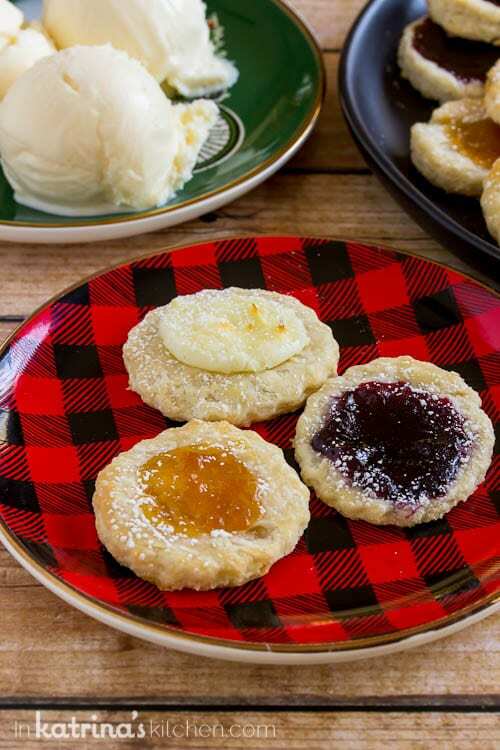 Top with sweet cream cheese or a thick jam filling, but be sure to use only a small dollop (about 1/2 teaspoon). I always bake these over parchment paper or a silicone baking mat (I’ll include links at the bottom) so that if any spills over it’s a quick clean up. Did you know that Milk is the No. 1 nutritious product requested by food bank clients, but it is rarely donated. The Great American Milk Drive is delivering thousands of gallons of milk to families who would otherwise go without. Going without milk, families miss out on high-quality protein and milk’s 9 essential nutrients that kids need to grow up healthy. ADA MIDEAST WILL DONATE 25 CENTS, THE AVERAGE COST OF 1 GLASS OF MILK, TO THE GREAT AMERICAN MILK DRIVE FOR EVERY “LIKE,” COMMENT OR SHARE EACH OF THE BLOGGERS’ RECIPES RECEIVE ON ITS FACEBOOK PAGE BETWEEN GIVING TUESDAY (November 28) AND DEC. 13. TOGETHER, WE CAN MAKE SURE EVERYONE HAS A GLASS OF MILK TO DRINK THIS HOLIDAY SEASON. Measure out 1 cup of ice cream and set aside to soften on counter while moving on to the next step. Cut butter into 8-10 small pieces. In a large bowl use a pastry blender to mix butter into the flour until the mixture resembles coarse crumbs (much like you would do while making pie crust). Add ice cream in the same way, cutting into the flour mixture until a dough forms. You can use a stand mixer with a dough hook for this step if you have one. Knead dough 6-8 strokes or until smooth. Cut into 3 separate discs. Wrap discs in plastic wrap and refrigerate overnight (up to 3 days). When ready to bake preheat oven to 400 F. Roll out dough to 1/4 inch thickness between a floured surface on bottom and the plastic wrap on top to keep dough from sticking to the rolling pin. 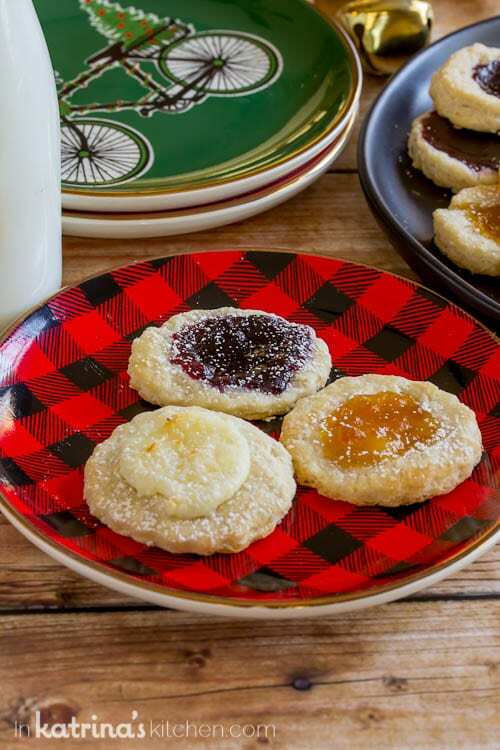 Use a circle cutter to cut out cookies. Each disc should yield 1 dozen cookies. Place parchment paper or a silicone baking mat on top of your baking sheet. This will make any fruit preserve spills easy to clean up. Transfer cookies to the baking sheet. 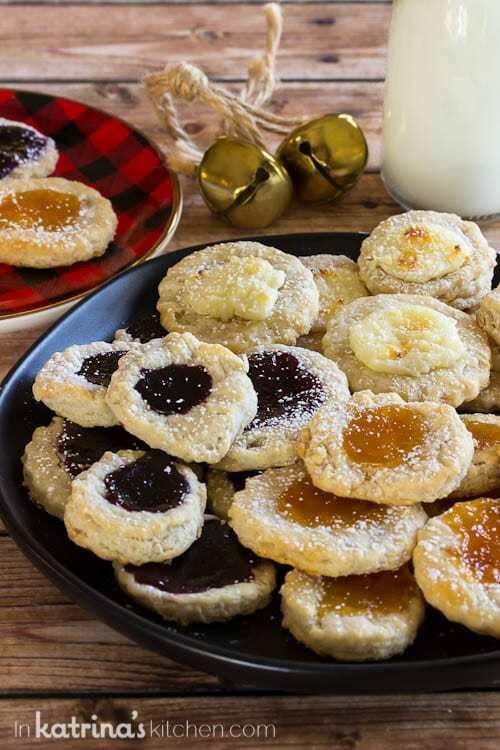 Using your thumb make an indent into each cookie and fill with 1/2 teaspoon fruit preserves or cream cheese filling. Bake for 12 minutes. Cool 5 minutes and transfer to wire rack to cool completely. Dust with powdered sugar before serving.